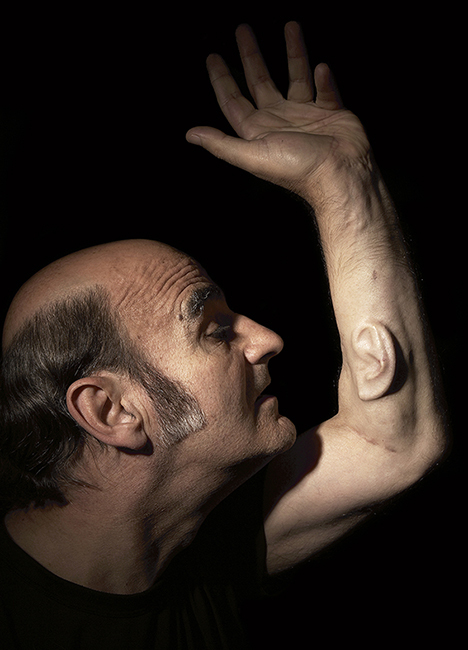 In 2007, the Australian performance artist Stelarc started growing an extra ear on his left arm through a series of operations that are still ongoing. The ear is actually made up of his own stem cells woven into a biodegradable frame. Eventually a Bluetooth device will be inserted and Stelarc will be able to hear and communicate through it. Stelarc’s work focuses on body enhancement, exploring the radical changes our bodies will undergo in the 21st century. 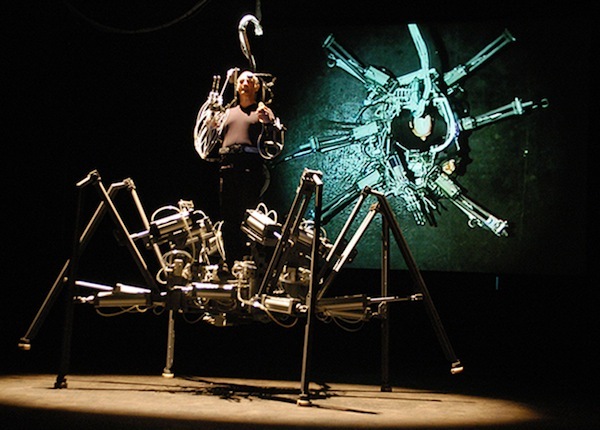 He also created “Exoskeleton,” a 1,300-pound prosthetic machine with six legs driven by 18 pneumatic actuators. Stelarc climbs into the middle of this huge device and pilots it with arm gestures. It is a harbinger of how technology and humans will increasingly merge—a future in which cyborgs (or robotic machines) will be operated by our brains, while the rest of our bodies will become obsolete. 21st-century art, science, and technology are fusing into a third culture—a new avant-garde. In these experiments, Stelarc creates a brand new art form using science and technology in ways that are artistically pleasing, or aesthetic. Our notions of science and aesthetics are two concepts that have been undergoing redefinition for centuries. Stelarc’s “Ear on Arm,” in London, Los Angeles, and Melbourne, 2006. I’ve studied the connections between art and science for 30 years, a passion first sparked while I was growing up in New York City as a kid interested in science in a city with some of the greatest art museums in the world. A few years after earning a doctorate in physics, I decided to focus on a question I was constantly asking myself: “What is the nature of creativity in science?” In studying the original German-language papers in relativity and quantum theory by Niels Bohr, Albert Einstein, Werner Heisenberg, and others, I was struck by the importance of visual imagery and aesthetics in scientists’ creativity. In the early 1500s, Leonardo da Vinci made no distinction between art and science. The imaginative submarines and helicopters he designed and drew were as much art to him as the “Mona Lisa.” A century later, in 1687, Isaac Newton’s magisterial laws of motion led to the “Age of Reason,” in which the search for truth resided in science and art was relegated to mere ornamentation. It was not for another 300 years that art and science began to move closer again. The rise of industries fuelled by spectacular developments in science and technology–the electrical dynamo, photography, and cinematography–plus scientific discoveries such as X-rays, radioactivity, and mathematicians’ explorations of multi-dimensional spaces inspired scientists and artists to new heights of abstraction. Einstein was inspired to discover special relativity in 1905 by his desire to remove the asymmetries in nature implied by how scientists interpreted equations in the physics of that era. He found these asymmetries “unbearable” because he believed passionately in a pristine beauty in nature that he thought ought to be reflected in the mathematics of a scientific theory. In fact, Einstein introduced beauty–simplicity in explanations, a sense of proportion in equations–as a guideline in scientific research. Developments in technology, science, and mathematics were also of central importance to artists. Pablo Picasso’s breakthrough 1907 painting, “Les Demoiselles d’Avignon,” contained the seeds of Cubism. Picasso interpreted X-rays, discovered in 1895, as revealing that what you see is not necessarily what you get, a keynote of Cubism in which forms are reduced to geometry. Picasso’s Cubism led to Futurism and then to Surrealism. Yet these art movements used only the ideas of science and technology, not the media like actual X-rays or actual cinematography. All this changed in the second half of the 20th century when electronics became readily available. But artists could not use this material without help from scientists, which led to collaboration. The first major collaboration took place in 1966 when the scientist Billy Klüver brought together 30 colleagues from Bell Labs and 10 artists from the East Village, among them Robert Rauschenberg and John Cage. This combustible mixture exploded in a series of performances called “9 Evenings: Theater and Engineering.” Rauschenberg’s performance started with a tennis match in which the lights automatically dimmed when each player hit the ball, while Cage filled the auditorium with a cacophony of sounds collected from various sources such as hotel kitchens and police and marine radio bands piped in from around the city through telephone lines. 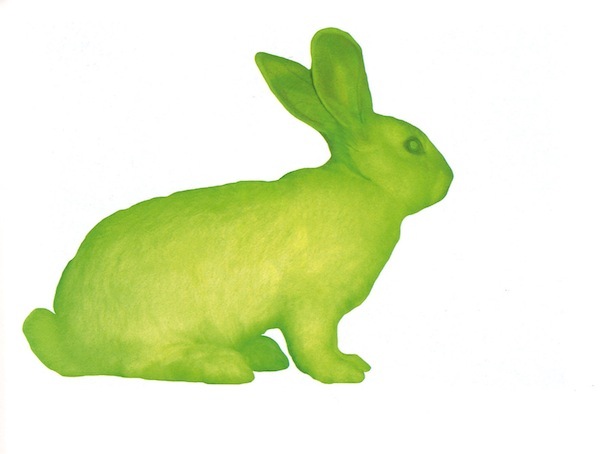 Eduardo Kac’s “GFP Bunny,” 2000, in which the artist combined jellyfish and rabbit DNA to produce a bunny, “Alba,” that glows green under blue light. In writing my new book, Colliding Worlds: How Cutting-Edge Science is Redefining Contemporary Art, I conducted more than 80 interviews with prominent artists and scientists working in the new art form. Through these conversations, I came to the conclusion that 21st-century art, science, and technology are fusing into a third culture—a new avant-garde. Eventually this fusion— “artsci”—will be known simply as art. This is a highly controversial conclusion because most artists and scientists believe that art is simply art and science is simply science and that’s it. Right now, even artists who recognize the importance of science and technology in their work consider themselves to be merely producing scientific illustrations rather than work that could lead to scientific discoveries. But the art created in conjunction with science can sometimes even benefit science. The British dance/science/engineering group “danceroom Spectroscopy,” which I discovered after I finished my book, choreographs beautiful pieces around themes like molecular dynamics. David Glowacki, a theoretical chemist at Bristol University in England, and his team came up with a dance performance called “Hidden Fields” in which interactive digital art and physics transform dancers’ movements into what the group calls “energy fields” that create disturbances in computer simulations of molecular dynamics projected onto a background screen. The super-fast algorithms cooked up for bringing together the dancers’ movements with the simulations of molecular motion have ended up helping scientists manipulate chains of protein molecules. They want to understand how proteins try to cooperate or bond together because mishaps in the process can lead to diabetes, cystic fibrosis, and Parkinson’s. Using these algorithms is sometimes 10,000 times faster than simply asking a computer to try different chains of protein molecules until it hits upon an appropriate structure. This is the future of art in our age of computers and algorithms. Painting with oils and other traditional art forms will persist, but I think they, too, will soon merge with science and technology in new and imaginative ways. For a taste of this future, check out an electronic art fair like Ars Electronica, held in Linz, Austria, every September. Ars Electronica shows works generated by science and technology, with new sorts of images and sounds that would be impossible without computers and algorithms. There are no paintings—in fact, they’re sometimes derisively referred to as “flat art” by proponents of artsci. Appreciating the new art on display at the fair requires knowledge of science and technology, computers, and algorithms. At Ars Electronica in 2012, visitors to Seiko Mikami’s installation “Desire of Codes” became actors in a work of art in which ambiguity reigns. The installation is made of six ceiling-mounted surveillance cameras on robotic arms and 90 wall-mounted sensors. These data are mixed with pre-recorded images and sounds from actual surveillance cameras to create images on screens in which the exhibition visitors see themselves walking through cities such as Berlin or in the countryside, as if in a dream or an alternate reality. In this new artsci, there is no one unique “Mona Lisa.” This is an art that does not stand still. Arthur I. Miller is the author of the recently published, Colliding Worlds: How Cutting-Edge Science is Redefining Contemporary Art. He is a professor emeritus of history and philosophy of science at University College London..
*Lead photo of Stelarc’s “Exoskeleton,” at Cankarjev Dom in Ljubljana, Slovenia, 2003 by Igor Skafar, courtesy of Stelarc. Interior photo of Stelarc’s “Ear on Arm,” by Nina Sellars, courtesy Stelarc. Interior photo of “GFP Bunny” by Chrystelle Fontaine, courtesy Eduardo Kac.